Close to the town center and the J. Clair square, the Les Rives du Léman Séjours & Affaires aparthotel is located right next to business parks (Parc d'activités de Saint-Genis-Pouilly and the CERN, an international scientific research center) with quick access to national and international transportation. The extended stay hotel will welcome you whether you're traveling for business or tourism, with daily, weekly, and monthly rates. 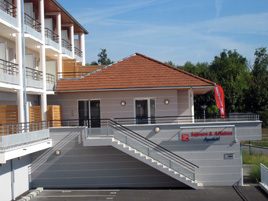 The Les rives du Léman Séjours & Affaires aparthotel, close to the Belle Ferme Equestrian Center, the center of Gex and its shops, combines international urban tourism and a relaxing environment. The town of Gex, located between the Jura mountains and Lake Léman, enjoys an exceptional geographic location. Many activities are available to you: skiing with slopes only 12 km from Gex, golf, but also water sports on Lake Léman, hiking, and relaxation in Divonne-les-Bains with hydrotherapy. The Gex area also means a wealth of historic sites (the town hall dating back to 1869, the ruins of a medieval chateau in Florimont, vestiges of the chateau of the sires of Gex, the Col de la Faucille mountain pass) and cultural sites (Geneva's museums, theaters, and concert halls). The aparthotel offers you 97 apartments on 3 floors, studios and one bedroom suites that are furnished, fully-equipped, and ready-to-live-in (1 to 4 people), with balconies. The modern and elegant architecture ensures our guest have a high quality, comfortable stay. The apartments include a sleeping area with a modular double bed or twin bed, an office area, a fully-equipped kitchen (refrigerator, hotplate, and microwave…), and a bathroom. Personalized service will brighten up your short, medium, or long-term stay: parking (covered), television, wifi internet, access to the gym, laundry facilities… Reception and breakfast are available from Monday to Saturday.